Travel does nothing if not fill one’s head with information that otherwise one would have considered useless or perhaps not considered at all. Take for instance the traditional Japanese Torii Gate, a structure with which, given our recent journeys we are not entirely unfamiliar. At the entrance to a Shinto shrine the gate symbolically marks the transition from the profane to the sacred. Profane is used here in the literal sense; “that which is secular” rather than when used to describe of a bunch of very rude words. Armed therefore with just enough knowledge to be dangerous, we set out in search of a reason for this particular gate’s being. Were we moored on the profane side of it or on the sacred? Had the Shinto followers in Metz decided to save on construction costs by usurping part of the cathedral for their own shrine? A quick scan of the resources available to us yielded no clue, but we did discover that increasingly smaller versions of the gate are being used in Japan as a symbol to discourage littering and public urination. If indeed that is the underlying reason for its being, it seems to be working at least as far as we can tell, although it doesn’t seem to have a hundred percent strike-rate on dog poo. So the Japanese inhabited France as well! 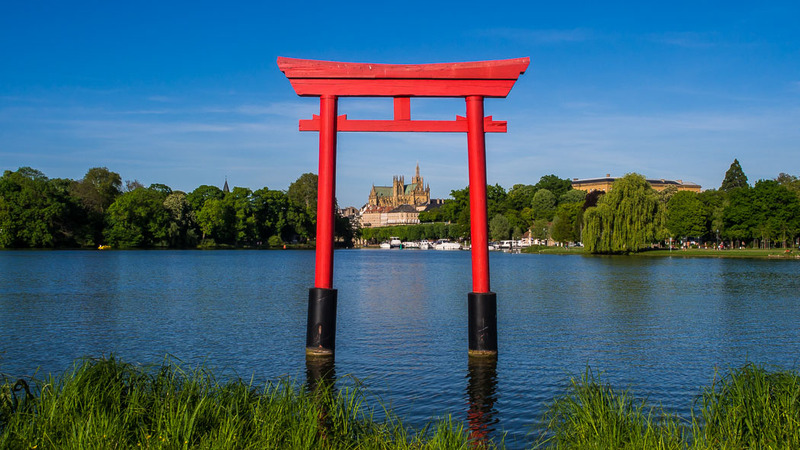 Such a nice contrast between the gothic cathedrals and the bright red torii gate. I wonder why they put it in the water?